The Weight Loss Nation “Podcaster” Challenge is off & running! April 30th is the deadline! If you are a Podcaster and want to lose weight and start living a healthy lifestyle, join the challenge! Send me an email to Support@TheWeightLossNation.com and tell me you want to participate in the challenge! The challenge will run from now until I announce the winner at Podfest Multi-Media Expo in March of 2019 in Orlando! Want to attend Podfest Multimedia Expo from March 7-9, 2019, in Orlando, Florida? Meet me and other awesome Podcasters like Dave Jackson, Gleen “the Geek” of Horse Radio Network or Katie Krimitsos from Biz Women Rock! Here’s the link! Join us in sunny Orlando, FL in March of 2019. Our first Podcast challenger has “Two” Podcasts. He hosts “Logical Weight Loss” which is all about his trials and tribulations of “trying” to lose weight…..
and his 2nd Podcast is “The School of Podcasting,” which is a phenominal show which helps you learn all about Podcasting. Dave Jackson has been Podcasting for 13 yrs. God Bless him! Dave really know about Podcasting, but he needs some assistance with losing weight and keeping it off, by living a healthy lifestyle! Hence, the Weight Loss Podcaster Challenge! Thinking about becoming a Member of Weight Loss Nation? I developed “Weight Loss Nation,” because I saw the need to help thousands of people, who are struggling with losing weight and living unhealthy. I knew if I started a journey that would lead me to a long-term healthy lifestyle, I could ask “anyone” to walk with me on the same journey and have the same results! 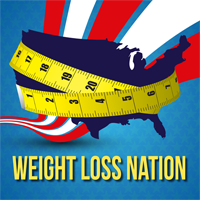 Listen to the “Weight Loss Nation” Podcast. Follow me on the journey to a long-term healthy lifestyle. I promise I will get you there! You may already be on your journey. If so, join me and let’s walk the journey together. IF you don’t know how to start the journey towards a long-term healthy lifestyle, keep listening to the Weight Loss Nation Podcast. You will learn about food….REAL food. You will learn what effect different foods have on your body. You will hear from experts, authors and people just like you and me…….telling their story of living an unhealthy lifestyle and what they did to change that. So… go to www.TheWeightLossNation.com and become a member! I look forward to seeing you in the private FB community and on the monthly seminar! Thanks so much for listening Nation! I know you have choices…..I want to provide you with everything you need to have a long-term healthy lifestyle! I’ll speak with you soon!